I was born and raised in South Jersey. And whenever I feel nostalgic for my home state, I crave Italian food. Cheesy, saucy, Nona-inspired Italian food. No chain restaurants, please. I’m talking a mom and pop corner trattoria, where the food not only fills the belly but feeds the soul. I’d been thinking about stuffed shells for about a month but never got around to making the dish. 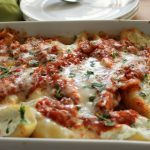 I hadn’t had stuffed shells in years, and I was about due to revisit this old-school Italian casserole. 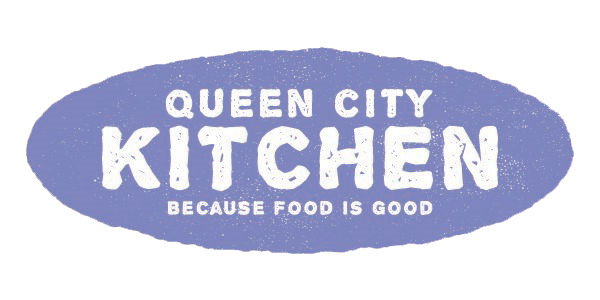 Since I had an upcoming appearance on Good Day Charlotte, I thought why not share the love. 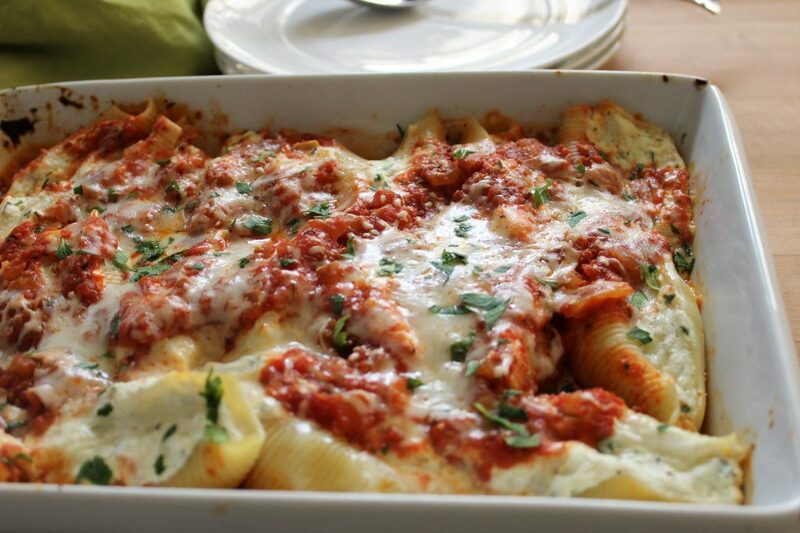 Stuffed shells is one of those feel-good dishes that wraps you in love. Each bite is almost as comforting as a warm hug from a plump grandma. And who doesn’t need that? Preheat the oven to 375 degrees F. Cook the shells in a large pot of boiling salted water until very al dente, about 8 minutes, stirring occasionally. Drain and rinse the shells under cold water to stop the cooking process. Drain thoroughly. Whisk the egg yolks and egg in a large bowl. Stir in the ricotta, Parmesan, parsley, 1 cup mozzarella; ½ cup provolone, heavy cream, oregano, and red pepper flakes. Season with salt and pepper. Transfer the filling to a large zip-top plastic bag. Spoon 1½ cups marinara sauce in a 9-inch by 13-inch baking dish. Snip off one end of the plastic bag. Working with one at a time, squeeze filling into shells. Arrange each shell in a single layer in the baking dish. Top with remaining 1½ cups marinara sauce and remaining cheese. Cover the pan tightly with aluminum foil and bake the shells until the cheese is melted and the sauce is bubbling, about 35 minutes. Heat the oven to broil and uncover the pasta. Broil until lightly browned on top, about 2 minutes. Allow the pasta to rest for 5 minutes. Sprinkle with more Parmesan and serve. This entry was posted in Casserole, Dinner, Entree, Italian, Pasta, Recipes and tagged cheese, Italian food, marinara, meatless, pasta on October 1, 2017 by Andria Gaskins.